The fight for our future…will be fought by our worst. Brilliant engineer Marcus Flynn has been sentenced to 11-H37 alongside the galaxy’s most dangerous criminals. 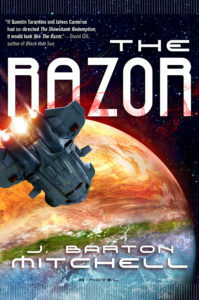 A hard labor prison planet better known as the Razor, where life expectancy is short and all roads are dead ends. In a few hours, prison guards and staff are evacuated, the prisoners are left to die, and dark mysteries begin to surface. Only Flynn has the skills and knowledge to unravel them, but he will have to rely on the most unlikely of allies – killers, assassins, pirates and smugglers. If they can survive each other they just might survive the Razor…and claim it for their own.